On January 6, Hathaway Brown senior Kavya Ravichandran of Westlake was named a semifinalist in the Society for Science and the Public’s Intel Science Talent Search competition. The Intel STS is one of the nation’s most prestigious math and science competitions and rewards rigorous original research conducted by high school seniors. Kavya was recognized for her work in Case Western Reserve University’s Department of Biomedical Engineering, where her research is helping to develop a targeted therapy for heart attack, stroke, and other vascular diseases. She worked in the laboratory of Dr. Anirban Sen Gupta under the mentorship of post-doctoral fellow Dr. Christa Pawlowski. She is one of only two Intel 2016 semifinalists in Ohio. She also is the only girl in the state to be recognized by both the Siemens Foundation Competition and Intel STS for her work this school year. In October, Kavya was named a semifinalist in the 2015 Siemens Competition in Math, Science and Technology for her multiyear original research project conducted through HB’s signature Science Research & Engineering Program. HB’s SREP is a four-year elective course of study offered through the school's Institute for 21st Century Education. The program, which was founded in 1998, places students in innovative research settings, where they work directly with practicing scientists. 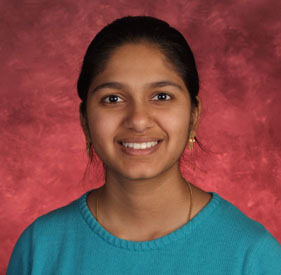 Kavya’s Intel semifinalist status brings the number of Intel and Siemens competition semifinalist/finalist designations for HB SREP students to an impressive 160. HB is honored to have more Intel Science Talent Search finalists than all other schools in Ohio combined in the last 18 years. As an Intel semifinalist, Kavya wins a $1,000 prize for herself, a $1,000 prize the SREP, and a chance to win between $7,500 and $150,000 and an all-expenses paid trip to Washington D.C. in March if she becomes a finalist. Congratulations, Kavya, and good luck!